After leaving college, Velez went straight into the workforce in fields such as system administration and cybersecurity for about five years before going back to school. He realized system administration was not what he wanted for a career. This epiphany is what made Velez decide to return to college for a degree. 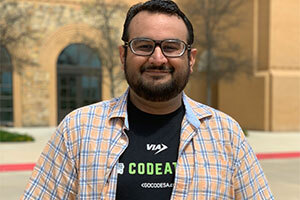 Although the University’s computer science program was well respected, Velez’s decision to attend A&M-SA was also a family affair. Velez’s wife, Juliana, who recommended that he explore A&M-SA’s programs, attended A&M-SA herself. She liked that the class sizes were smaller and more personalized. Velez’s chapter at A&M-San Antonio will end this fall after commencement, but his journey here will not end once he crosses that stage. “If one person can influence others, and help people find their way, that’s a legacy,” Velez said. “If you can help shed a little bit of light for others that are still trying to figure out who they are, that’s also a legacy. I’d like to leave behind a legacy that allows people to come here and be who they are,” he added. Velez said he feels that it is important for students to connect with groups of people who allow them to be and express themselves. Being able to bond with others in that way is what helped him grow academically and personally.